A film probably most famous for its Russian roulette scenes which punctuate various anti-war points director Michael Cimino makes throughout the section set in Vietnam, but it’s a stonewall classic. Like most people, I also sometimes find watching the supposed must-watch films that critics rave about quite a daunting task. Particularly so when those films happen to be 182 minutes long, such is Michael Cimino’s 1978 Vietnam war drama, The Deer Hunter. I’m not entirely sure why the length of a movie can be as off-putting as it often is. I would quite happily sit down and watch three or four episodes of a TV series in one go, as I’ve done recently with the second series of Utopia. Perhaps it’s possibly due to the fact that if the first 50 minute long episode of a TV show is no good, you can stop. A film is more of a commitment. You are promising to give someone else’s art 10,800 seconds of your undivided attention; especially if you are planning to go to select cinemas this weekend to see the re-release of this 1978 classic. 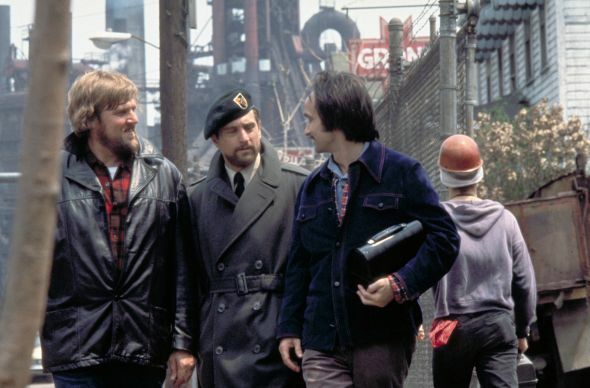 Nevertheless, this staggering portrayal of a steelworker (Robert De Niro) in a small working class American town who joins up with his mates, including Christopher Walken and John Cazale, to go fight in the Vietnam war is as breathtaking today as it was back when it won five separate Oscars. The stark portrayal of POW camps, seedy backwater gambling joints and the loss and sacrifice of friends is as powerful today as it has ever been. However, it is a film that does come with a certain amount of notoriety. For every positive review you’ll read, I wouldn’t be surprised to find another absolutely slating it. As mentioned, I’d always been slightly wary due to a strong cohort of folk who I know who had hated it. They’ve called it boring, pretentious and dull, which immediately gives you an impression of what to expect. The wedding scene near the beginning will either have you fascinated by the lives of these ordinary people about to go through a very extraordinary thing. Or, as happens fairly often apparently, will have you shifting about in your seat and checking your watch with regularity. Those people are wrong, of course, as the depiction of life for a group of small town working class hunters, confronting the horrors of the Vietnam war, and then going back to normal again, is totally engrossing. De Niro once again shows why he’s one of the world’s best actors. Walken is also great and it’s a fantastic performance from a young Meryl Streep to boot, but ol’ Bobby is utterly, utterly superb. As his character takes charge of the situation (sometimes because he wants to, others because he has to) displaying a totally self-imposed lack of empathy for his fellow men, this man comes alive. There’s something real going on there. As his dignity is ripped away from him, he becomes one of cinemas most fascinating characters. If you like films about the people, the every-man, and the part they played in the Vietnam war, then it is most definitely worth a watch and I can think of no better way to experience it than in the cinema. If you’re expecting a war film, you might be let down. Why not just sit down and play? Go on. Take a chance. You can find Owen over on Twitter (@ohughes86) and you can find The Deer Hunter in cinemas from 1 August.